Colonoscopy is a common endoscopic procedure, with more than 3 million examinations performed in the United States annually. The efficacy of colonoscopy to prevent colorectal cancer is dependent on the quality of the procedure. National benchmarks have been established as minimal targets to meet or exceed in order to maximize the benefit of the colonoscopy. Three important metrics include the percentage of procedures in which the endoscopist reaches the cecum (Cecal Intubation Rate), the time spent looking at the colon mucosa on withdrawal of the colonoscope (Withdrawal Time), and the percent of screening colonoscopy cases which result in the identification and removal of a precancerous polyp (Adenoma Detection Rate). 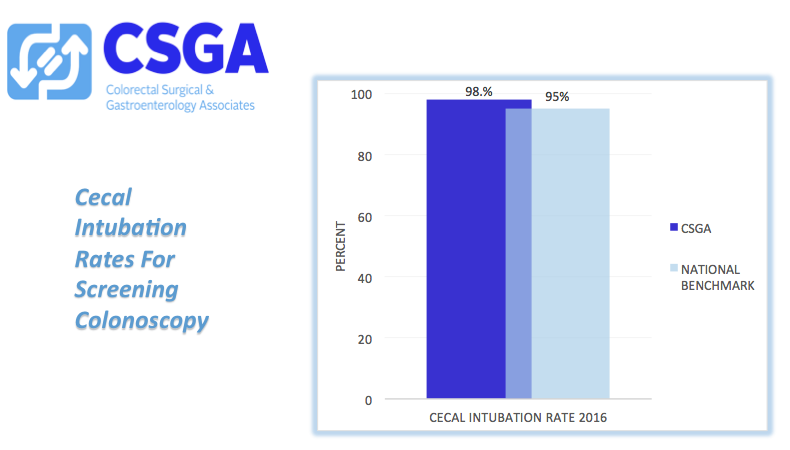 Click here to download our Quality Data Informational PowerPoint document detailing the three important metrics (Cecal Intubation Rate, Withdrawal Time, Adenoma Detection Rate) National benchmarks have established as minimal targets to meet or exceed in order to maximize the benefit of the colonoscopy. The cecum is the very beginning of your colon. It contains the appendix and a valve where the small bowel contents leave the small bowel and enter the colon. Physicians who perform colonoscopy will need to reach this area to begin the screening examination. Sometimes, reaching this area can be challenging and time consuming. A physician performing high quality colonoscopy should reach and fully evaluate this area in, at least, 95% of all screening colonoscopies performed. At CSGA we are reaching the cecum in 98% of all screening colonoscopies. This is better than the national standard of care! The screening examination process begins after the colonoscope has been passed through the colon and advanced into the cecum (the beginning of the colon). Once the beginning of the colon is reached the physician will slowly withdrawal the colonoscope through the colon while closely inspecting the colon’s folds and lining. A physician performing high quality colonoscopy will spend an average of greater than 6 minutes inspecting the entire colon during screening examinations. The quality of the colonoscopy does not increase as a physician’s cecal withdrawal time increases beyond 9 minutes. Quality of colonoscopy does decrease, however, when a physician’s average cecal withdrawal time is below 6 minutes. 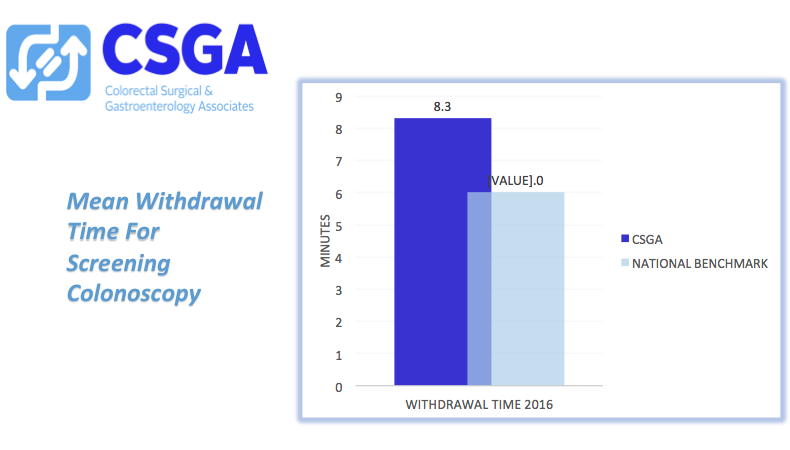 At CSGA our average Cecal withdrawal time is 8.3minutes. This is better than the national standard of care! An adenoma is a precancerous polyp. This is a growth in the colon that can, overtime, develop into a colon cancer. This is what physicians are looking to identify and remove during your colonoscopy. The adenoma detection rate is the percentage of the time a physician performing a screening colonoscopy will identify and remove a precancerous polyp. Physicians performing high quality colonoscopy should be finding and removing adenomas in at least 30% of all male screening colonoscopies and 20% of all female screening colonoscopies. As physician’s adenoma rate increases the patient’s risk of developing interval colon cancer or dying from colon cancer decreases. This is to say that as a physician’s adenoma detection rate goes up the patient risk of developing a colon cancer or dying from colon cancer between their first and second screening colonoscopy goes down. 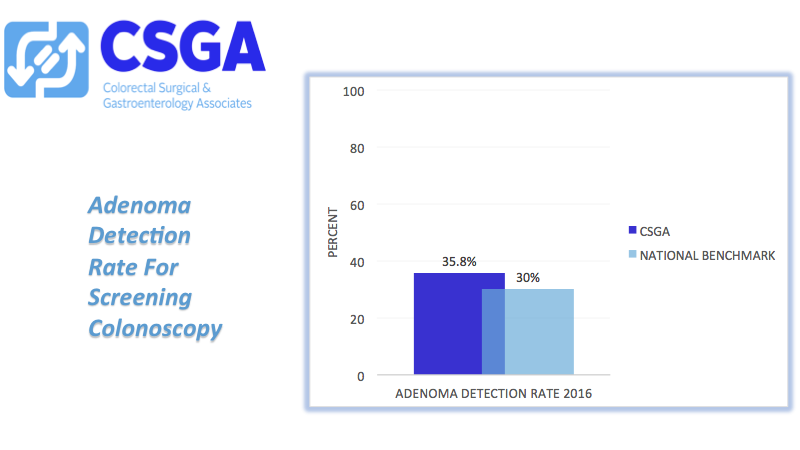 At CSGA our adenoma detection rate is 35.8%. This is better than the national standard of care!